What are sablefish? What do sablefish eat? Do small and large fish consume the same prey? Come to this talk and find out! 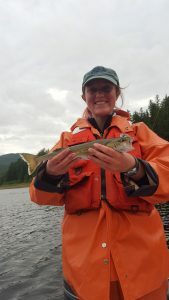 Willa Johnson will be presenting her thesis research comparing the diets of two size classes of juvenile sablefish. She will also be presenting a little slice of Alaska’s natural history from her summer in Juneau. From fish stomach contents to glaciers to whales to birds, there is lots to explore! Willa Johnson ’19 is the 2018 Arthur G. Rempel Scholar and a senior at Whitman College majoring in biology. She is interested in fisheries, ecology and science education. She is very involved around campus including leading trips for the outdoor program and working as a biology lab assistant. In her spare time Willa enjoys reading, birding, kayaking and baking. Her favorite bird is the Harlequin Duck. Arthur G. Rempel taught biology at Whitman College from 1938 through the mid-1970s. He was a founding member of Blue Mountain Audubon Society and in his honor, Blue Mountain Audubon annually presents a biology major with a scholarship in his name to support their studies at Whitman College. ← Christmas Bird Count 2018 Results!